We started out the morning exactly the same as yesterday. The Cafe is way too good to be true and why mess with a good thing. From there we walked to the Reichstag (Germany´s Government building). On top of the building is a huge egg shaped dome. It is free to go up too but you have to make a reservation a minimum of three days in advance. We were able to make our reservation on the Reichstags website and were emailed our confirmation shortly after. I would recommend being at least 15 minutes early for your appointment; we had to go through security (very similar to the airport) and a screening process. Once we were up it was definitely worth all of the hassle: the views were amazing!! We were given a free audio guide that pointed out the attractions that can be seen from the dome. When we came down from the Dome we walked to the nearby Brandenberg Gate – very touristy but worth seeing. After we walked to nearby Potsdamer Platz, this area of the city was completely destroyed in WW2 and was recently rebuilt in the 90´s. It is now covered in very modern buildings and it the cultural area of the city. We walked around the Sony Center that is filled with restaurants, pubs, a movie theatre and Film Museum. When they were rebuilding this area of the city they tried to incorporate the old buildings everywhere they could. The Grand Hotel used to be located here before it was destroyed, a few of the walls remained standing and the builders have encased them in glass and built them into the new structure. I thought it was an amazing way to show the old and new at once. We then took a tram to Schloss Charlottenberg (a Prussian Palace in the heart of the city). The gardens are now a public park with children’s play grounds, duck ponds (which you know I was excited about) and great walking/biking trains throughout. It was roughly one km to walk from the back entrance of the park to the formal gardens around the palace. We got to the Palace just in time to miss a small downpour. It was 6 Euros to tour the palace and the audio tour was free. The palace is extremely beautiful and it filled with lots of art. My one complaint was about half way through I was told that I wasn´t allowed to take pictures unless I paid an additional 3 Euro free upon entering. I thought that was pretty silly to say the least…who doesn’t take pictures? From there we had supper at a nearby restaurant. I was able to get goulash and bratwurst. More things I was able to check off of my “to eat” list. We ended the night in the Hofbraauhus in Berlin. It was very similar to the famous beer house in Munich! I had an absolute amazing time exploring Berlin today!! This morning for breakfast Regan and I went to a nearby cafe and we were able to get a patio table overlooking the Spree River. The views were amazing!! It was a beautiful day today in Berlin – average temp was 25C and I may be slightly tanned now. We had a traditional continental German breakfast of a three tier platter of cold meats, a variety of cheeses, dips and sauces, mixed bread basket and a boiled egg. You made yourself an assortment of open faced sandwiches which were absolutely amazing. This is definitely something we are missing out on in Canada. From there we walked down Friedrich Strasse one of Berlins main fashion district with lots of high end fashion labels along it, (There are a lot of nose and fingers prints on the windows from me window shopping!). We stopped into Gallerie Lafayette a French mutli-level department store – this is where I would like to call my new home. The building and decor are almost more amazing then the merchandise inside. We wandered down to the nearby Gendarmen market, with two churches and one of Berlin’s three opera houses. The square holds Berlin’s most famous Christmas market in the winter. We paid three Euros to climb the tower at Französischer Dom (one of the two churches in the square). After climbing more stairs when I would like to admit to climbing, we reached the top and were rewarded with amazing views of the square and city. Upon descending we stopped by a local Bavarian pub to quench the thirst we had acquired from all those stairs! We walked further down to the Wall Memorial, Check Point Charlie and the Check Point Charlie Museum. 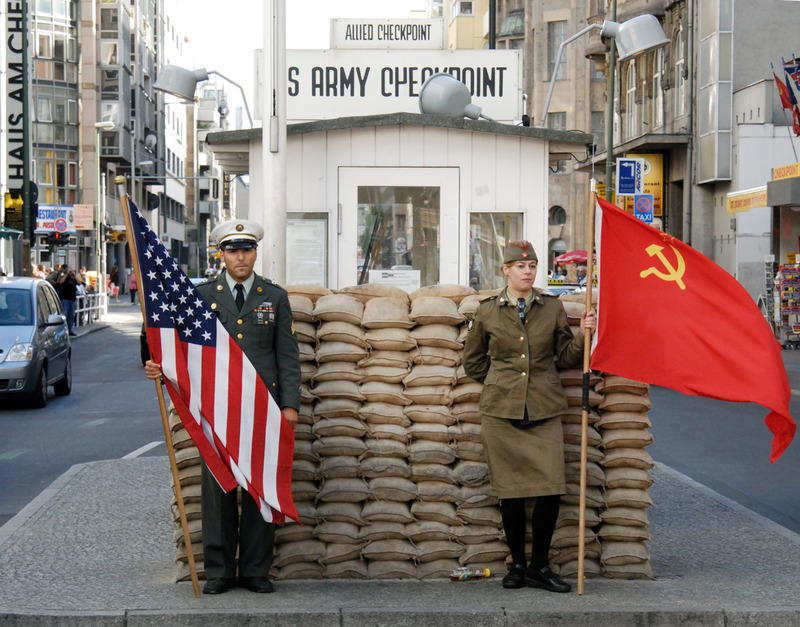 Check point Charlie was the only border crossing in Berlin that Westerners were allowed to go into East Berlin from. I had my picture taken with the “soldier” on duty and my passport stamped to show that I have “been” to East Berlin. From there we hopped S-Bahn (the suburban subway) and made our way out to Oranienburg a nearby suburb of Berlin. The train took us 45 minutes to get there. Upon arrival we walked roughly 20 minutes to the concentration camp Sachsenhausen. Entrance into the camp was free but we did rent audio tours guides for three Euros each. I’m not able to describe what I saw there yesterday, I am still trying to process it. It was important that I went and would recommend if you ever have the opportunity to go see a camp to do so. I can tell you I was overcome with great sadness walking through it. After the camp we hopped back on the train and made our way back into the city for the highlight of my day – a Football game!! This has always been on my bucket list and I am happy to say I was not disappointed. 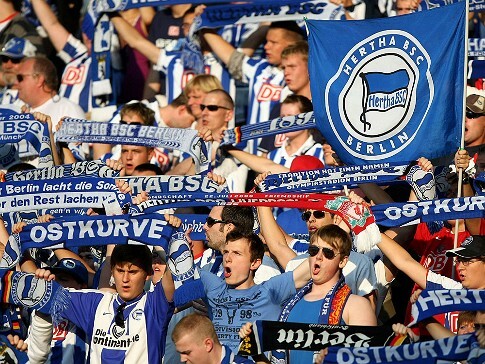 Berlin’s Hertha BCS had their first of two playoff games. We were able to purchase tickets on fairly short notice (Tuesday of this week) for a great price of 30.00 Euro each. We had amazing seats in the upper level, but they were in the first row and right in front of the center line. The subway ride there and festivities surrounding the soccer field are half the fun! Even if you are not a football (soccer for us North American’s) fan I would recommend going to a European game if you have a chance. With over 68,000 (that isn’t a typo) in attendance the crowd is absolutely amazing – they do not stop cheering, chanting, singing and clapping the ENTIRE game. The crowd was almost more amusing then the game at times. My best description would be a Saskatchewan Roughriders game but on steroids, it was amazing. Unfortunately, Hertha lost by one point in the end but I have high hopes for their second game next week. “Güten Tag from Berlin!! I left Saskatoon yesterday at 3:20pm on-board Air Canada. I had one quick stop over in Toronto (1.5 hours) which was perfect: enough time for my bags to makes it but I really didn’t have to spend any real time in Toronto airport (YYZ and I don’t always get along). Air Canada’s international service was great!! The staff were excellent, food was decent (a large meal after Toronto and a quick breakfast before landing) and my pillow/blankie/touch screen TV made the flight quite enjoyable. I am all caught up on my movie watching!! I landed in Frankfurt around noon and had given myself four hours before my next flight to go through customs and re-check in with my next airline. I do still recommend having that amount of time in case of a delay but I honestly didn’t need it. It was the easiest customs of my life – in about 10 minutes – and had no problems finding my way around. Frankfurt airport is very nice; everything is clean, modern and well laid out. There were tons of shopping and dining options for me while I waited (I did my best to hold out on the shopping though this early into the trip). My next flight was with Air Berlin, I had booked myself a short one hour hopper flight between Frankfurt and Berlin (very similar to a Saskatoon to Calgary flight). I had never booked Air Berlin before, and because of the cheap fare I wasn’t really sure what to expect, but I was pleasantly surprised. They are a great airline that I would recommend to anyone bouncing around Europe. The Highlight was the fist-sized chocolate heart every passenger received upon getting off of the flight. Once I was in Berlin I had no problems getting from the airport to my partner in crime’s house for the next few days – my step brother Regan. Berlin’s transit system is amazing: bus, tram/street car (Strassenbahn), U-Bahn (subway) and S-Bahn (suburban train system)! Everyone I have encountered so far had been extremely nice and spoken some English (I got into a small fight with the bus ticket machine at the airport and received lots of help). After a quick freshening up we were off to explore East Berlin, we walked to Prenzlauerberg a trendy district not far from Regan’s house. I managed to have two of the items off of my “to eat” list while in Germany: a Pretzel (amazing) and CurryWurst (sausage, ketchup and curry powder mixed in a small dish). 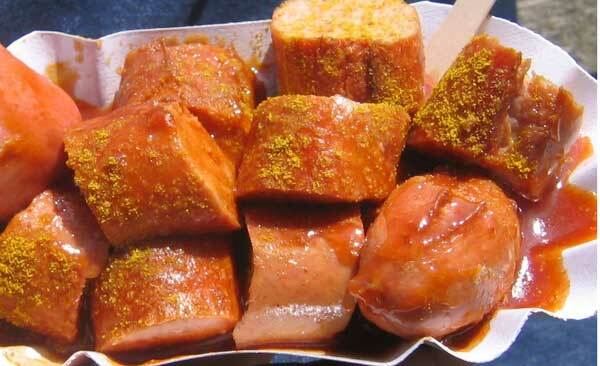 The Currywurst was actually very good and I’m told the ultimate street food in Berlin. The locals love it so much there is even a museum in its honour but I don’t think I am going to have time to visit it while I am here. We then made our way to a local beer gardens and finished off the evening there. The only bump in the road I have run into so far is I have no cell phone reception what-so-ever. I had spoken to Sasktel before I left and was told that it wouldn’t be a problem to text home but sadly that is not that case.